The Forte collection offers some of the best looking cabinet knobs and pulls. 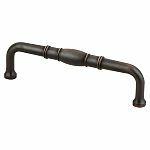 These elegant designs come in 6 beautiful finishes Weathered Nickel, Brushed Nickel, Oil Rubbed Bronze, Rust Glaze, Venetian Bronze and Rustic Iron. No matter where you decide to put them, they will add a new look and feel to any room of the house. This product is on closeout and cannot be returned. Limited to quantity on hand. Note: This product is also known as 82681VBP, BQ82681VBP on other websites. Warranty: Limited warranty. Includes all necessary mounting hardware.